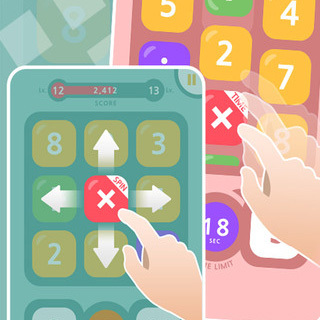 Look at the most addictive puzzle games over the years and there’s one common denominator – simplicity. 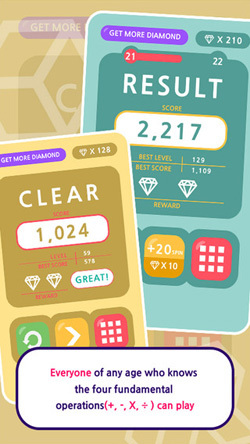 Tetris, Bejewelled, Puzzle Bobble, these games rely on a few basic rules to keep us entranced. Livezen’s Math Cube follows the same approach and is built entirely on one core idea, and while it’s not in the same league as those classic puzzlers it still proves surprisingly captivating. The nature of Math Cube’s puzzle structure is, as alluded to in the title, all about mathematics. That alone may be enough to chase away many potential players, even though the math involved here is rudimentary stuff. If you’ve survived the first few years of school, you should be able to handle the puzzles that this game throws at you, at least on the Easy setting. Math Cube is based on a game mechanic somewhere between a mathematical Rubik’s Cube and one of those sliding tile puzzles. At first glance it seems complicated, and the clumsily worded tutorial pop-up messages don’t help much, but it only takes a moment to figure it out. You’re presented with a 9-tiled square, each with either a digit or a mathematical operation symbol (+,-,x,÷), and a “goal” number; the aim is to rearrange the tiles on the horizontal or vertical axis to equal that goal score. 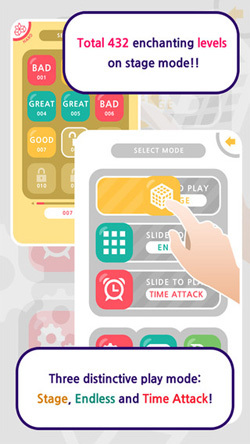 This structure means that both math novices and experts can enjoy Math Cube on different levels: For younger gamers, this is a fantastic way to learn, incorporating a compellingly challenging game structure which will have you coming back for more. 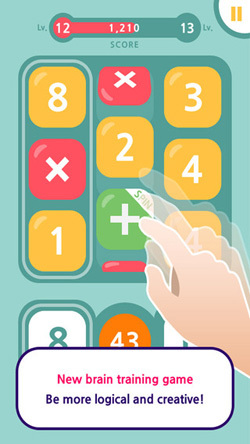 For those who already have the basic operations under control, the challenge here is more about speed and mental dexterity – the focus isn’t on solving the simple math questions, but on completing the puzzles as quickly as possible. With hundreds of stages to solve across three (very similar) modes, there’s a lot of brain-teasing puzzle gaming packed in here for those not turned off by the subject matter. The fundamental concept is simple but strong, and never overwhelms with unnecessary complications as many puzzle games do. Some variety to the modes on offer would have been welcome, though. The design language is sleek and attractive, if unimaginative, with flat slabs of subdued colors and bold sans serif fonts and a neat interface which responds well to touch inputs. It’s an inobtrusive aesthetic which works well in the context of increasingly challenging time trials and frantic puzzles. 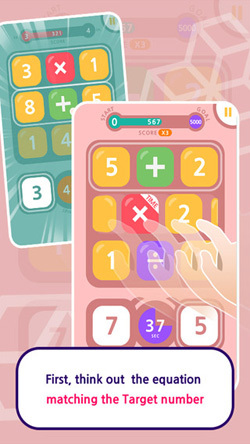 Tricky without becoming frustrating, puzzle fans who are looking to tax their minds a little further than just lining up different colored candy sweets will find that this free (but annoyingly ad-supported) app has a lot to offer.